described by Herbert Oehler below. In years past, as the days grew shorter and the temperature began to cool, work on Kerr County farms didn’t slow down. Take for instance the Oehler family who had a small molasses mill on their farm between Ingram and Mountain Home in the “upper Johnson Creek valley” in 1907. You and I don’t really think about sweeteners: if we want sugar we just hop over to H-E-B and buy a package. 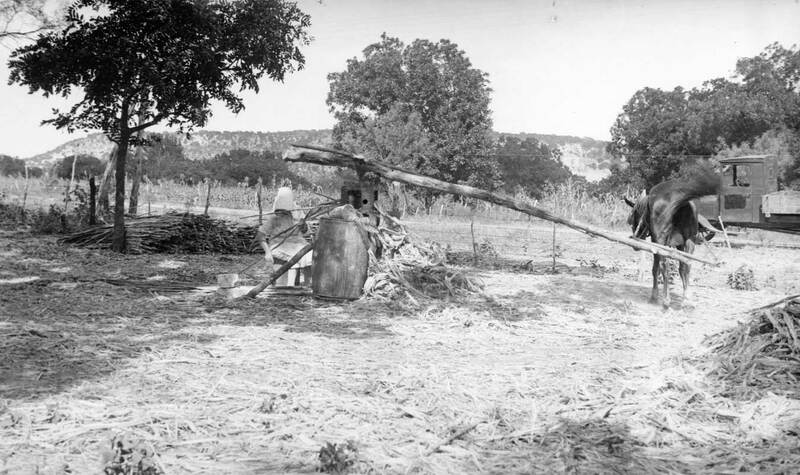 And while sugar was available at grocery stores in Kerrville in 1907, many families grew their own cane and had it processed by a neighbor. “We didn’t get into molasses making intentionally. It happened because there was a molasses mill and cooking vat on the place when we bought it… and Papa was not one to pass up an opportunity to cash in on the use of available equipment, even if it wasn’t familiar to him. I am sure that the Tom Parks family who lived on the place before we moved there were instrumental in teaching Papa and Mama how to operate it. While we always process the other neighbor’s cane crops for them, I remember that the Parks’ made arrangements each year to use the equipment to process their own crop. “Papa preferred orange or redtop cane rather than the sugar cane because it had tendency to fall over when nearly mature, resulting in the stalks becoming twisted and crooked. This made them hard to handle and hard to feed into the mill. community project by Clate Smith. “When the cane was ripe it had to be stripped, that is, the leaves had to be knocked off. This was done with wooden paddles while it was still standing in the row. Tripping paddles were made of boards two or three feet long and three or four inches wide. With a drawing knife a handle was shaped on one end and the two sides were sharpened. Sugar barrel staves were ideal for this since they were made of light, tough wood and were the proper length and width. 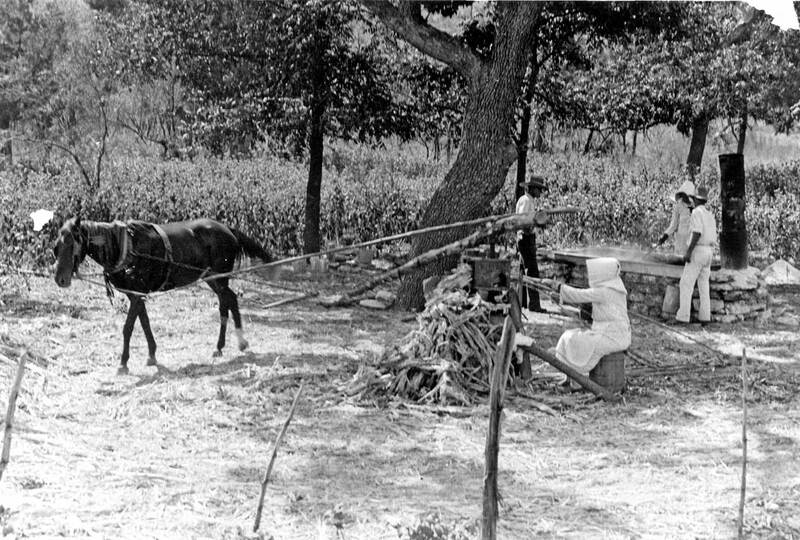 Even though it was a lot of work to get the cane ready to process, the real work began once the cane was taken to the mill. The cane juice was cooked, and impurities skimmed off “with a sieve-like, long-handled” skimmer. This scum was fed to the hogs. The price of molasses in those days was about 10 cents a pound. The Oehlers processed a lot of cane for their neighbors in the early part of the last century, during harvest time. Making things sweeter took a lot of work! Joe Herring Jr. is a Kerrville native who is thankful for many blessings, most of them sweet. This column originally appeared in the Kerrville Daily Times November 24, 2018.